A four bedroom villa to rent in Caleta de Fuste Fuerteventura that can sleep up to 8 people. The villa has a private heated swimming pool and sea view. We had a great time at the villa we booked through Karen Durant from Holidays 4U last month. We chose one situated in Caleta de Fuste near the golf courses. It had a heated pool and a large roof terrace which had a sea view. The owner had thoughtfully left a welcome pack for our arrival, which we were surprised to see and very pleased as it included a bottle of prosecco as well as the normal things you would expect such as water, tea, coffee, milk, fruit juice, bread, butter etc. The villa is set in a quiet area, which we loved as we booked it to have a relaxing quiet holiday. Will definitely be booking again for next year. I stayed in a villa in Caleta de Fuste with my partner last July and thoroughly enjoyed my holiday. We chose the resort as we wanted a quiet holiday away from the hustle and bustle of the more busier Corralejo resort. The villa we chose had air conditioning, which is a bonus at that time of year. It was around 40 degrees. We felt that there were some nice homely touches. The owner had left some books and games, as well as some DVDs which we very much enjoyed. Although the TV did have some English channels. We ate out most nights and discovered some great little restaurants in the resort. Will be returning! This villa in Corralejo to rent is a three bedroom apartment, which can sleep 8 people as there is a sofa bed in the lounge. It has wifi internet access. 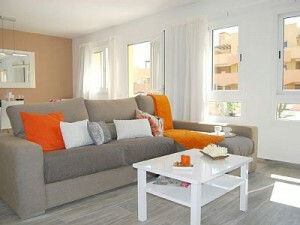 This three bedroom villa in Corralejo to rent can sleep up to 8 people with a sofa bed in the lounge. The villa is very well equipped with wifi internet access and satellite TV (which includes English channels). In the lounge there is also a dining table and chairs. The kitchen is very well equipped and includes a washing machine and dishwasher as well as a tall fridge/freezer, full oven, microwave, coffee maker, toaster and kettle. The master bedroom has a double bed and the other two bedrooms have twin beds. There are two bathrooms, one with a bath and the other with a shower cubicle. Outside there is a communal pool and the villa also has its own terrace with sun lounger, patio table and chairs. 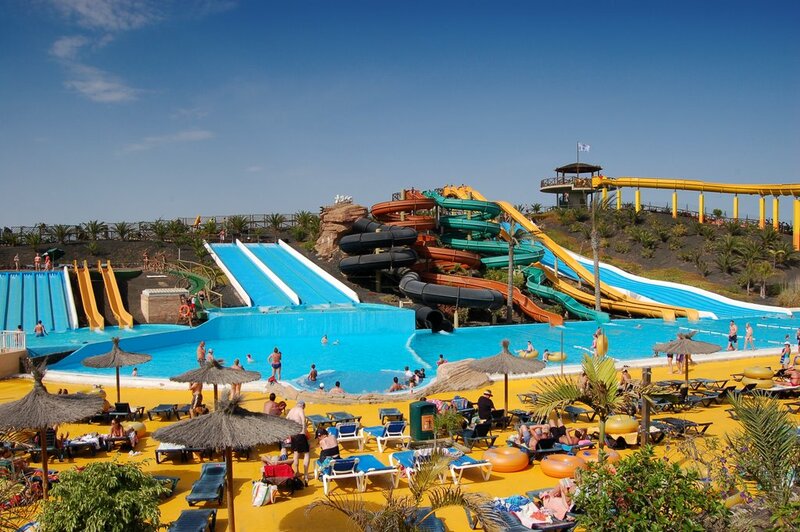 Leisure and water park situated in the Corralejo resort in Fuerteventura. 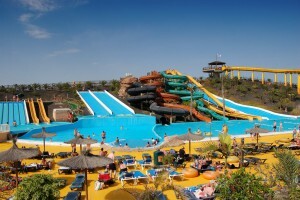 Baku Water Park is also known as Corralejo Water Park. It is really more of a leisure park rather than just a water park. Of course there are plenty of pools and water slides, but there are also other attractions including go-karting, a tennis academy, a haunted house and mini golf plus much more. There are also plenty of restaurants and shops. The pricing is very reasonable. An adult ticket will cost 25 euros or 20 euros after 3pm. A child ticket costs 19 euros or 14 euros after 3pm. You could also purchase a 2 day ticket for 38 euros for adults or 29 euros for children or a one week ticket for 85 euros for adults and 60 euros for children. Children are classed up to the age of 11 years. Children under 3 years old go free. You will have to pay extras for an inflatable ring if required (5 euros) or wait for one for free. A family-sized locker costs 5 euros and wifi if required costs 2 euros. A beautiful villa with three bedrooms right on Galera Beach in the resort of Corralejo, Fuerteventura. The villa has air conditioning and wireless internet access. 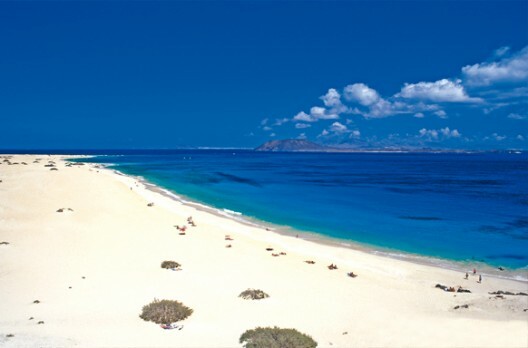 This beach villa in Corralejo Fuerteventura is available for holiday rental. It has three bedrooms and two bathrooms. Enjoying all the modern conveniences, it has air conditioning and wireless internet access. Out side there is a private heated pool with sun loungers and a sun parasol. A private gate leads directly to Galera Beach, which has incredibly soft white sand. It is also gently shelving so very calm and safe for families. 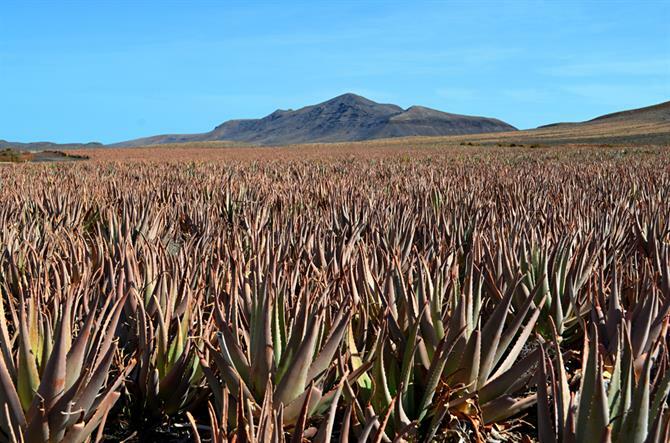 Fuerteventura is said to produce the best aloe vera in the world, which is surprising when you think that the volcanic landscape isn’t good for growing plants in general. Aloe Vera has incredible qualities and endless uses. You can drink it, it can be used for perfume, for sun protection, to keep skin looking young, as shower gel or as shampoo. Although it looks like a cactus, it is actually party of the Lily family, as is garlic. There are over 400 different varieties of Aloe Vera, but the variety with the magical qualities is ALOE VERA BARBADENSIS. It is happy growing in dry ground with little water, and likes lots of sunshine, making Fuerteventura a perfect place for it to flourish. It has been used throughout the ages. Alexander the Great used it for healing wounds from battles and Cleopatra is said to have used it as a beauty cream. Christopher Columbus is said to have stocked his ships with Aloe Vera plants before returning from the Canary Islands. 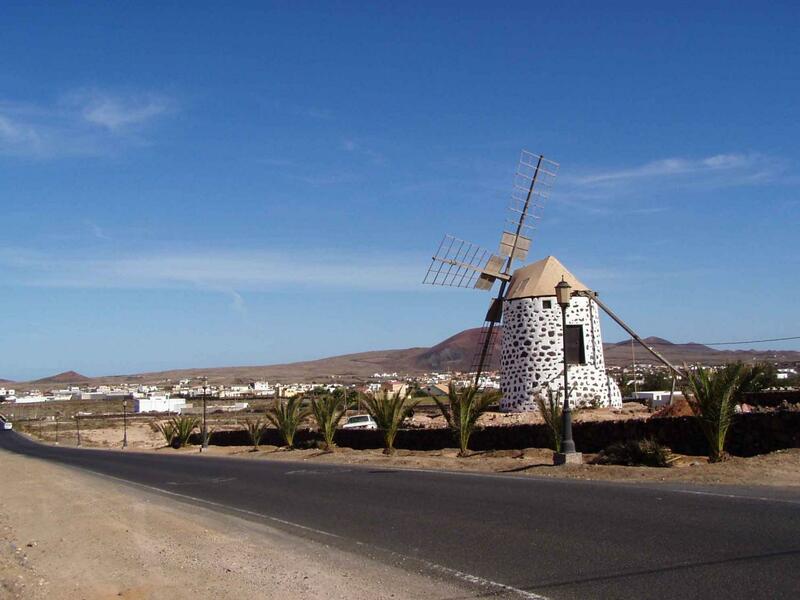 We can recommend a trip to the Aloe Vera Plant, if you are planning to visit Fuerteventura. 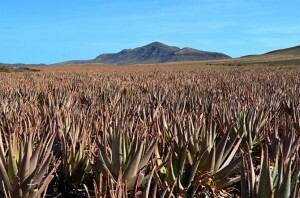 It is situated in Tiscamanita, or the Aloe Vera Information Centre in Jandia. There are also Aloe Vera plants in the Valles de Ortega. 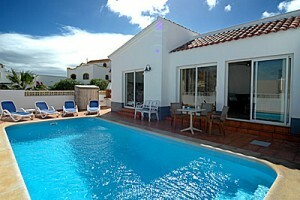 A three bedroom villa in Corralejo for rent with private pool. The villa has wifi internet access and satellite TV. 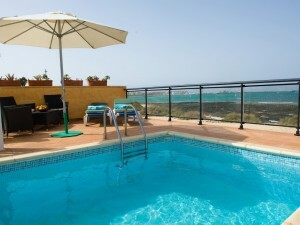 A three bedroom villa with private pool in the Corralejo resort in Fuerteventura. The villa has wifi internet access and satellite TV. 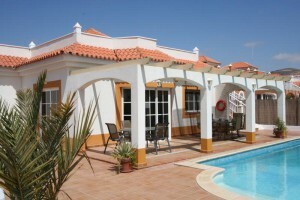 A spacious, luxury villa in Corralejo for rent. It is very well located, being only a 10 minute walk from the centre of Corralejo and a 15 minute walk from the famous Flag beach. There are three bedrooms, two with double beds and one twin room. The master bedroom has an ensuite bathroom. There is a 2nd family bathroom. The living room is spacious and modern in style with a comfortable L-shaped sofa, satellite TV including English channels and a dining table and chairs. Outside there is a private pool and a garden with sun loungers. A pagoda provides partial shade for a seating area and there is an upper terrace with spectacular views. The modern kitchen is fully equipped and includes extra touches such as a juicer, blender and coffee maker. There is also a washing machine and dishwasher. 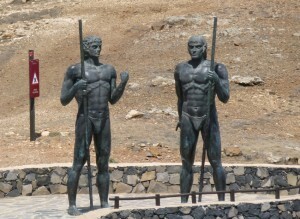 The island of Fuerteventura was first inhabited by a primitive pagan people, before the invasion of the Europeans. 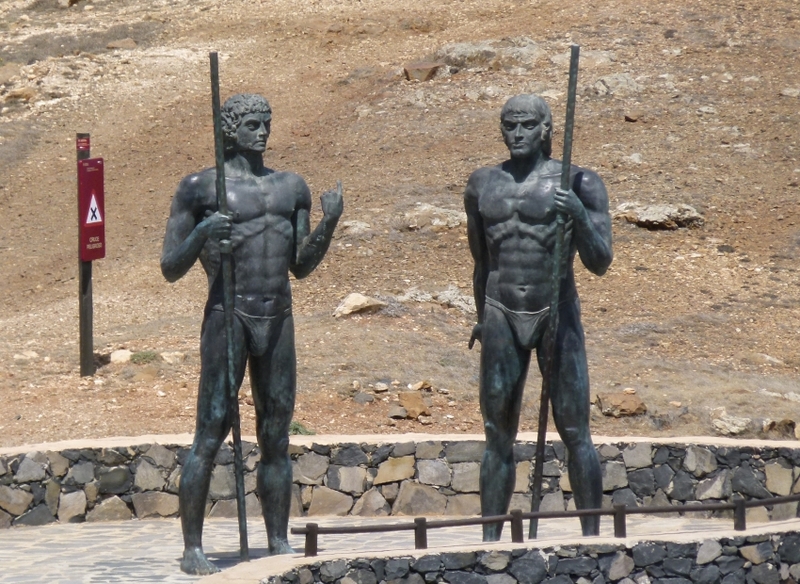 These people were called ‘Mohorero’, coming from the word ‘mahos’ which is the goatskin shoe which the people wore. The Mohoreros are said to have come originally from North Africa. A wall divided the island into 2 kingdoms. In the North Maxorata was ruled by Guize and in the South Jandia by Ayose. Both were advised by two priestesses Tamonante and Tibiabin. The Mohoreros used to live in underground dwellings and caves. They lived on cheese, milk, goat’s meat, fish, shellfish and golfio which is made from toasted barley flour and is still on sale in supermarkets today. They were a spiritual people, who used the mountains for pagan ceremonies and rituals. A lovely four bedroom villa on the sea front in Corralejo, Fuerteventura. The villa enjoys great sea views from several of the bedrooms and from the roof terrace. This luxurious villa with sea view in Corralejo Fuerteventura has four bedrooms and two bathrooms. Villa Anna is surrounded by a high wall which offers privacy for guests when sun-bathing and swimming in the electrically heated pool. The pool is surrounded by sun loungers and sun umbrellas and there is also a patio table and chairs for alfresco dining. A set of stairs leads up to the roof terrace which offers stunning sea views and more sun loungers for sun-bathing. Inside the villa has been well furnished with quality furnishings. The lounge has a large flat screen TV with satellite channels. The master bedroom has a king-size double bed with an ensuite bathroom, the 2nd bedroom has a double bed and the other two bedrooms are twin rooms. The 2nd, 3rd and 4th bedrooms share a family bathroom with a jacuzzi bath with overhead shower. Corralejo is the most popular resort in Fuerteventura, situated on the Northern tip of the island. 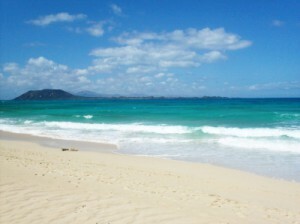 The beaches have beautiful white sand and calm gently shelving waters, ideal for families. The Old Town has a good selection of fine restaurants and traditional Canarian bars offering tapas. Close to the harbour there are some good fresh fish restaurants. For the more adventurous there are plenty of water sports on offer such as windsurfing, kitesurfing, jet-skiing, diving and snorkelling. There are also excursions available including a trip to the neighbouring island of Los Lobos, catamaran. glass bottom boat or deep sea fishing trips. Children will love the Baku water park with its wave pool and water slides.